Windows 10 New Feature: Spartan Will Play DVD and Flash Videos? Windows 10 New Feature: Spartan (Microsoft Edge) Will Play DVD and Flash Videos? On January 21, 2015, Microsoft has confirmed that Windows 10 will ship with a new browser, codenamed "Project Spartan". It is much lighter and more flexible than Internet Explorer. Windows 10 users are allowed to annotate a web page with a stylus, and even share the annotations with other guys. Thanks to the integration of Cortana digital assistant, Spartan users can use Cortana to surface data on flights, hotel bookings, package tracking and other information within the traditional address bar. Additionally, Spartan will enable users to group tabs in a new way. This brand new browser does have many advanced features, but is Spartan powerful enough to play DVDs and more flash video file types? If it is, Windows 10 users can utilize Spartan to play DVD videos without the need of third-party DVD player, and play online flash videos fluently. Spartan (Microsoft Edge) Will Play DVD Videos? Generally speaking, people prefer to play local videos using video player software. But actually, some browsers can also be used to play locally stored videos. For example, You can use Firefox/Chrome browser to play MP4/H.264 videos simply by dragging and dropping. Maybe, Spartan (Microsoft Edge) is also able to play local videos in MP4 or more file types. But it is definitely a difficult job for Spartan to play DVD video, be it wrapped by a DVD disc, ISO file or DVD folder. But if Spartan can play local videos in mainstream formats, you can use WinX DVD Ripper Platinum to help convert DVD to Spartan playable video formats. Rip and convert any DVDs including tightly encrypted commercial DVDs to (Spartan) browser playable video formats with the help of WinX DVD Ripper Platinum, the most powerful DVD ripper for Windows 10, 8, 7, etc. WinX DVD Ripper Platinum is the most popular DVD ripper for Windows 10, 8, 7, XP, etc. It is able to rip and convert both homemade and copy-protected DVDs including Disney DVDs to MP4, WMV, AVI, FLV, MOV, H.264 and more popular formats and devices containing Microsoft WP8, Xbox, Surface Pro, iPhone 6/6 Plus, iPad mini, iPad Air, Samsung Galaxy Note 4, Sony Xperia Z3, etc. You can convert DVD to browser supported video formats, such as MP4, within a few clicks. Step 1. Download, install and launch the DVD ripper. And then load DVD source. Step 2. Select output profile. You can choose "MP4 Video" as your target output format. Step 3. Set destination folder to store the converted DVD video. Step 4. Hit RUN to begin converting DVD to Spartan playable format. Tips: This DVD ripper is also available to rip DVD to Windows 10 compatible formats, say, MP4, AVI, WMV, etc. And its Mac version can even help rip DVD to MKV. * The software developer only advocates ripping DVD for personal use and suggests referring to the related DVD copyright laws before doing so. Spartan (Microsoft Edge) Will Play Flash Videos? It is sure that Spartan will play flash videos, just like other browsers. Moreover, Microsoft announced that Windows 10's web browser namely Spartan (Microsoft Edge) supports HLS and DASH adaptive bitrate streaming protocols. Simply put, Spartan users can stream video from various websites using a method where video quality is modified dynamically according to current data connections. But if you find that Spartan playing flash videos still come with lots of buffering or want to enjoy flash videos with high image quality, why not download the flash videos for offline playback. WinX HD Video Converter Deluxe allows users to free download videos from YouTube, Dailymotion, Metacafe and other 300+ video sites in SD, 720P, 1080P HD, 4K UHD video quality with the built-in free YouTube downloader. Step 1. 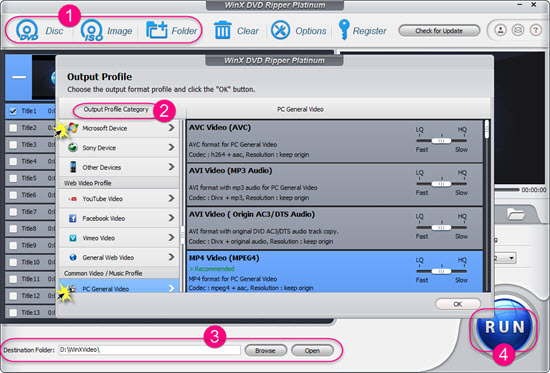 Click "YouTube URL" button in WinX HD Video Converter Deluxe. Step 2. Open YouTube website, find out and play a target video, copy the video URL from YouTube address bar, and then paste and analyze it in the YouTube video downloader. After a while, you are required to choose the video resolution based on your own needs. If you don't want to convert the video formats, please uncheck "Auto convert". Step 3. Hit RUN to begin downloading the videos. After finishing downloading, you can play the downloaded flash videos using Spartan or your media player. Besides, this video converter is able to convert flash videos to other Windows 10 supported file formats, such as, convert flash videos to MKV, AVI, WMV, MP4, 3GP, convert MP4 to MKV, etc. What can Windows 10 users do with WinX HD Video Converter Deluxe? -	Free download YouTube flash videos to MP4, FLV, WebM, 3GP. -	Convert any videos to Spartan playable formats. -	Convert SD/HD (MTS, M2TS, AVCHD, etc.) to Windows 10 supported file formats. -	Make vivid photo slideshow videos on Windows 10.